The Dan Holzapfel Farm Pavilion is situated at the northern end of our Museum and was opened on 31st May, 2013, by Governor of Queensland, Penelope Wensley. It contains in excess of 100 items associated with farming in the Redland area, many of them dating from the era 1920-1970, when it was known as “The Salad Bowl”. Farms were then the dominant feature of the Redland landscape. The southern wall of this Pavilion features a mural depicting this landscape. See above. It was painted by Christian Griffiths of AEROGRAFFIX between 20.1.2014 and 16.2.2014. 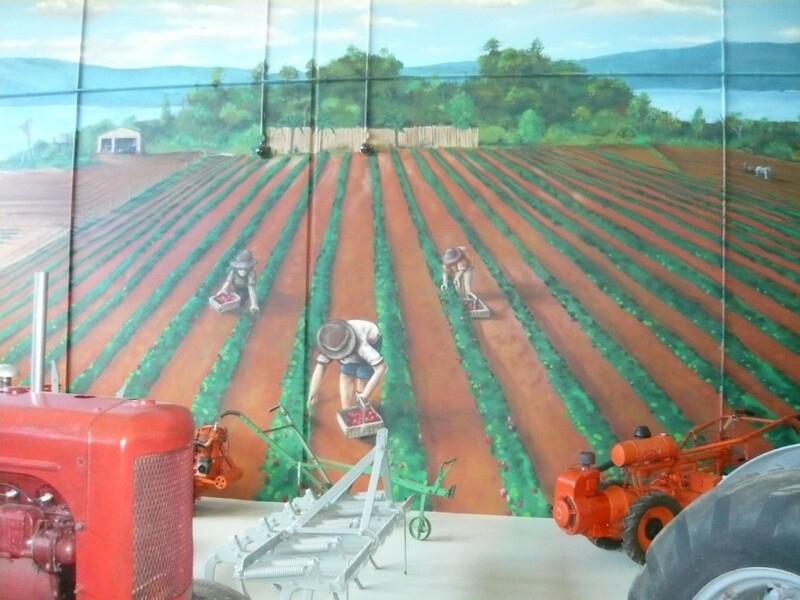 In this area of the Pavilion, in front of the mural, are a Simar Rototiller, a Howard Rotacutter dating from ca 1949, a reversible plough, a Howard Rotary Hoe and a red Farmall tractor. Next we come to a Ferguson Tractor, followed by a blue and orange Fordson tractor. The 1900 Garrett engine dominates the next section of the pavilion. It is attached to a green chaff cutter. Next we see the 1918 Mogul portable engine. This is a 4 horsepower, 450 r.p.m. machine, made by the International Harvester Corporation. It is in working condition and has had a number of restorations since it was donated to us. Its portability made it a very versatile engine, able to undertake a variety of tasks on a farm. A Model TT Ford truck is nearby. In the centre of the Pavilion is the Well Room, an area fenced in timber and containing machinery and items connected with the obtaining of water, its distribution and management. Water has always, since time immemorial, been of vital importance to farming. So this section dominates the Pavilion, perhaps by virtue of the Halladay Windmill, which dates from ca 1890. This windmill was made by a farmhand, Daniel Halladay, in Batavia, Illinois, but was found in parts in a shed on the farm originally owned by MILES FOX but owned by Doug Burns in 1970, the year in which our Museum founder, the late Norm Dean O.A.M., and Norm Austin found it. The farm was on the corner of Bloomfield and Princess Streets, Cleveland. The restoration of this mill took 2½ years of painstaking effort by 7 Museum volunteers and other helpers. Also in the Well Room is the Buzacott Farm Pump Engine. This 1.5 horsepower engine is four stroke air cooled and one of 55,500 of this type produced between 1909 and 1931. Production of these engines started in Australia in 1921. Along the western wall are 13 items and also five alcoves. In the first of these are saws, hammers, drills, axes and chisels. Then follow 4 refrigerators, an ice chest, seed planter, shovel, a pick, mallet, wooden trolley, 2 post drills and an adze. As if this were not enough, on the northern wall we see a collection of 18 stencils once used on Redland farms to identify their produce and the stamps they produced. A little further along on this same wall we see a collection of various types of barbed wire, ranging from the ordinary type used to fence farms to contain livestock through to the type used in prisons to contain inmates! This article provides merely a glimpse of life in the Salad Bowl. A visit to the Redland Museum will provide a much clearer picture of this very interesting bygone era in Australian history.